Prioritize paying off debt, or save more? 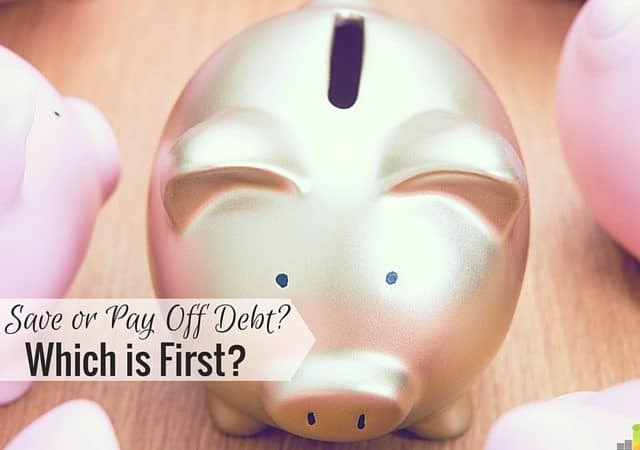 This age old question affects a lot of us who are in debt. It’s a constant struggle once you become financially aware, of figuring out how much money to throw at your debt and how much money to sock away for your future. There are different schools of thought on how to sort it all out and in the end, it often comes down to making the decision that’s best for you – and accepting that what’s right for you may not be what’s right for someone else. Personally, once I realized how much my debt was holding me back from doing what I wanted to do with my life, I set out on a mission to eliminate it ASAP. I threw everything I had to my debt last year and it felt great. Unfortunately, I neglected my savings account. This year I’m doing things differently. Let me tell you why. I had a really bad day at work last year. I felt even worse when I realized I couldn’t even take a day off from work or freelancing even if I wanted to because I couldn’t afford it. I had a very small emergency fund at the time, and ‘not being in the mood’ didn’t really qualify as a formal emergency. Needless to say, I felt pretty trapped even though I was consistently working toward debt freedom. Having extra money saved up offers lots of peace of mind and a nice financial cushion for you to fall back on whenever there’s an emergency, if you need to correct a budget failure, or dare I say it – if you just feel weak and need a break. If you’re afraid to take a break because you’re not sure if you can afford it, tracking your expenses and saving through a free financial tool like Personal Capital will help you know how your day off will affect your finances and make a decision with confidence. I’m a hard worker and tend to just power through most days if I’m not feeling up to it or even if I feel a little sick. But tiptoeing around day after day being afraid to take a day off was no way for me to live even though I was in debt so I set out to build up a cash buffer and increase my emergency savings this year. 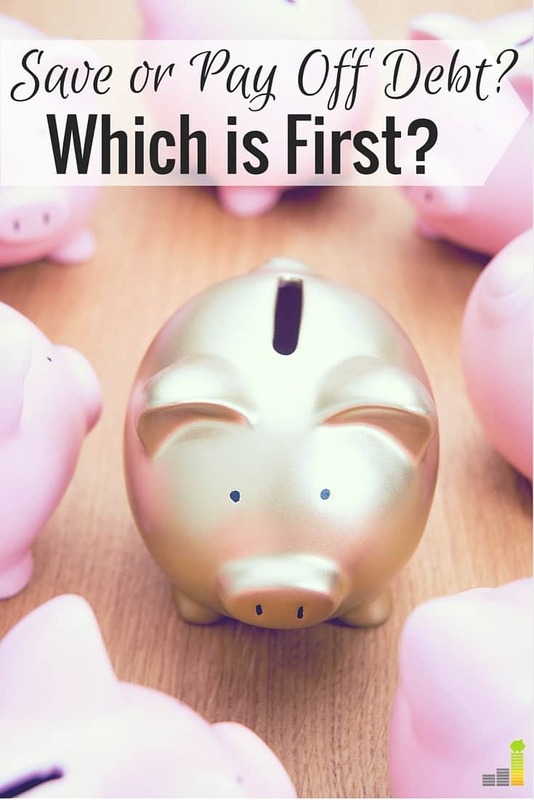 Some financial experts including Dave Ramsey recommend saving at least $1,000 in an emergency fund, then attacking your debt in order to become debt free. This method works for a lot of people but doesn’t work for me. I’ve always known that $1,000 in savings was not enough for my family and I to feel comfortable if we ever did encounter a real emergency. My fears turned into reality when my husband got laid off this past spring right in the middle of our wedding planning process. It was a scary time for us in terms of finances because we were just starting to build our emergency fund and we had lots of bills and wedding vendors to pay. Luckily, he secured another position at the company weeks after getting laid off and has since moved on to an even better job. I knew that if it would have taken him a few months to secure another job, we probably wouldn’t have had enough savings to cover the income loss during that time which is scary. No matter what you do or where you work, your job is not always 100 percent secure so it’s important to have enough savings to cover a job loss and a have a backup plan even if you are in debt. Saving and attacking debt are both very important to me so this year, I decided to split the extra money I was putting toward my debt and put half of it into savings each month. At first, I thought I would hate this because I’m all about paying off debt. I worried that paying off less debt this year could feel like a big blow. I realize I could have practically paid the remainder of my student loans off this year if I neglected savings like I did last year but I’m just not willing to take that risk. I’ve worked hard to increase my income and lower my expenses so I can afford to do both. I still manage to make extra payments on my debt which helps motivate me to pay it off, and I also continue to save a suitable portion of my income which gives me peace of mind and provides more opportunity. It’s really the best of both worlds. Yes, I’ll have to keep paying off my debt for a little longer than I originally planned, but I don’t have to stay up at night wondering how I would cover our next emergency and avoid accumulating more debt due to a lack of savings. It’s definitely a balancing act, but I’m pleased with my choice for now. What do you think about paying off debt over saving or vice versa? Do you feel like you should save up an amount you feel comfortable with, then plow through your debt? How much do you think is important to keep in an emergency fund? This is a great question and the topic of continuous debate and I think it depends on each person’s situation. If you can get a 401k match at the office, then get that first before touching any debt. If you don’t, then it depends how much your debt is costing you. If it’s credit card debt, then I would put a minimal amount in retirement, maybe 5%-10% and pay down the credit cards ASAP. At this point, we only have mortgage debt. We max out our retirement and HSA accounts at the office and the rest goes towards paying off the house. Our emergency fund is a $100k HELOC which we can tap if/when we need it. I think it all comes down to how much your debt is costing you. Right now I have student loans at 3% and 4% which is really low. I’ve already paid off the 6.8% ones. Even though I wanted to have all my loans paid off by the end of this year, it’s looking like this will happen at the end of next year instead since I chose to save. For me, it was totally worth it because anything can happen during the next few years and my loans are not costing me that much currently even though I really want them gone. Either way, I won’t be stuck paying off student loans for 10 years so I’m happy about that. I don’t blame you for wanting more cash in savings. Savings is freedom! It is! Being debt free offers a certain sense of freedom but it’s different than the feeling you have when you have a nice financial cushion to back you up. I never did think that $1000 was enough of an emergency fund. One major car repair can wipe that out! I suppose the amount in savings is different for everyone and should be adjusted as so. The important thing is that you are still tackling your debt instead of burying your head in the sand like many do. Congrats! That’s what always worried me. Back when I was in college, the service light wouldn’t go off in my car and I had to pay almost $1,000 for car repairs to fix it so I could pass the state emissions test and be able to drive. I don’t ever want to be wiped out by car repairs like that ever again. I’m with you in thinking that 1k is not enough for an emergency. It’s especially true if you are remotely worried that you either might get laid off, or the job is so toxic you HAVE to get out. I think everyone is different an you have to do what is best for you and your family. My personally, I would aggressively save and have a comfortable cushion, then pay off debt. Doing both makes total sense to me! When we had student and consumer debt, we built our emergency fund while paying off the debt. Doing both isn’t fast, but it provides peace of mind. We try to keep 6 months income in savings, but I’m starting to question if it’s too much to have sitting there collecting little to no interest. Chonce I commend you for being so wise and hard working at such a young age! And for realizing what works for you and taking that path. I also agree that $1000 just does not go very far anymore. $5K is better. My best wishes to you always my fellow frugalista! Sometimes having more savings is better! You never know what life will throw your way! It pays to be prepared. Interesting point on feeling trapped. I found the opposite actually and felt free once I had my debt wiped out. Once I had the debt gone, I was able to quit my job and take a new more satisfying job. One thing you can do though is, rather than directly pay off the debt, you save the money you would have paid to the debt into a savings account earmarked for debt repayment. That way you have the money ready to deploy towards the debt, but it’s still liquid just in case you need it. Once your balance in that account equals your debt balance, you can make the decision on whether you’d want to keep it or just write a check and pay everything off. It is definitely a delicate balance. I agree that I don’t feel comfortable with only have 1000$ in savings considering one major emergency could cost more than that. Not only does the answer to this questions change from person to person, but sometimes I’m gung ho one way or another. Lots of savings and being debt free both provide freedom and opportunity, so you can’t go TOO wrong either way. Better than getting into more debt! Its great to see someone else’s thoughts on a crucial balance in an individuals life. I have spent a lot of time and money towards repaying debt, but knowing I have the capability of saving some extra cash without any repercussions is relieving.